Bethesda, Md. : PDA today announced the availability of "Medicine and vaccine shortages: What is the role of global regulatory complexity for post approval changes? ", a report by The Economist Intelligence Unit. PDA commissioned the report with funds from the Parenteral Drug Association. The report aims to explore whether the varying regulatory requirements for post approval changes to pharmaceutical products across the world are associated with medicine and vaccine shortages. The report confirms that drug product shortages are an ongoing global problem, and the causes of shortages are complex, multifaceted and not well understood. Finding a permanent solution for shortages is critical for achieving global health goals. 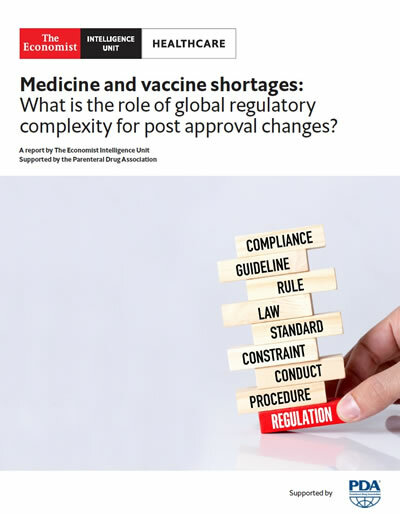 While unable to correlate the global regulatory complexity for post approval changes to drug shortages, the report found it could be an aggravating factor that delays or hinders shortage mitigation actions. There is universal agreement that regulatory convergence and harmonization are beneficial to all stakeholders, and that trust and political will are required for harmonization and convergence initiatives to succeed. "PDA is proud to have funded this important research," said PDA President/CEO Richard Johnson. "PDA thanks both the researchers from The Economist Intelligence Unit and PDA volunteers from the Post Approval Change: Innovation for Availability of Medicines Task Force for supporting this effort." Medicine and vaccine shortages: What is the role of global regulatory complexity for post approval changes?